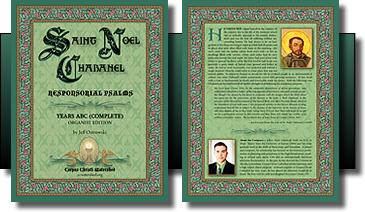 For the first time in history, Catholics can purchase a complete book of Responsorial Psalms with each Psalm verse carefully written out for organist and cantor, using the modality of Gregorian chant. Back in 2007, I started composing chant versions that notated each verse. It took forever, but I felt that organists and cantors would appreciate the extra time and effort. As of 27 October 2012, I’m happy to say that the complete set is available for purchase and, as a matter of fact, has already begun shipping! This handsome 387-page book contains all the Psalms for Years A, B, C, and ABC. If you order during October, using the code “OCTBOOKS12” will save you 20% off the total price. The website also contains a useful link to coupons you might need in the future (for instance, I believe the code “WELCOME” will save you 15%). The edition has been dedicated to His Holiness, Pope Benedict XVI, who is a true servant of Jesus Christ.